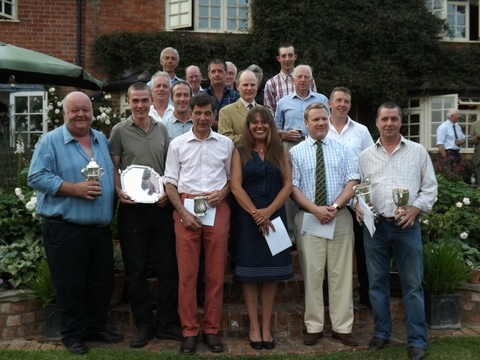 The COTTESMORE HUNT HEDGE-CUTTING SOCIETY, hold an annual "ON THE FARM" competition that is open to all farmers and their family members, farm staff and professional hedge-cutters working in the Cottesmore Hunt Country. The Cottesmore Hunt took on the responsibility for running what was then the Hedge-Cutting and Ploughing Match Competition from a subcommittee of the Rutland Agricultural Society in 1926. 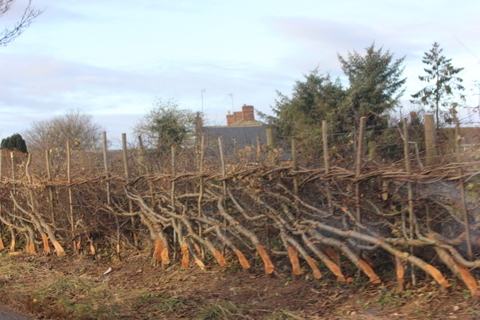 The minimum length of hedge to be cut, layered, staked and bound is 3 chains (66yds.) in order to qualify for entry into the competition. The work had to be completed for the judging that took place on 5th May. 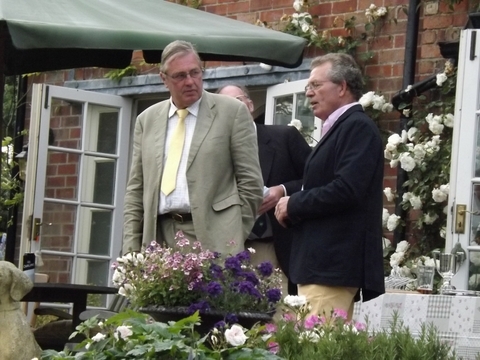 The judges for this year's competition were Michael Winterton Esq., from Queniborough, and Robert Symington Esq., from Seldom Seen Farm, Billesdon, Nr Leicester. 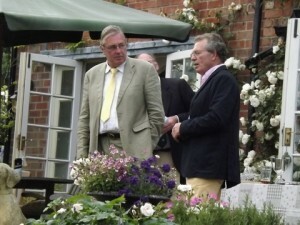 The prize giving party was held on July 12th at Hill Top Farm, Oakham, by kind invitation of the Society's Honorary Secretary, Mr. William Cross and his wife Jane. Over 85 guests attended and the prize giving to took place in the garden. Robert Scott, the chairman thanked all of the competitors, farmers and landowners for the support and explained that without the generous donations from the subscribers of the Cottesmore Hunt there would be no funding for the competition and prize giving party. The chairman thanked the judges for their time given on the day of judging the entries. Members of the committee and their wives were thanked for their help in organising the party. Mr. Michael Winterton and Mr. Robert Symington, both judges, then replied and congratulated the cutters and farmers on their outstanding work which is so important in maintaining the beauty and viability of our rural hedgerows and the overall views of the countryside. The prizes were presented by our President, Mr. Richard Wright. After the prize giving the guests enjoyed an excellent supper produced by committee members' wives. The guests could also view the photographs of the winning lengths of hedge which are taken and presented each year by Mr. George Morley of Teigh who may be contacted on 01572 787 497. There was also the very popular viewing of all the hedges on a screen. There are two main classes viz. Class I, for Professional Cutters operating in the Cottesmore Hunt Country and Class II, for Farmers and their family or employees cutting on their own farm. There is also a Class for hedges that have been trimmed until the last year or two and also a special prize for the hedges entered in the 2011/12 competition which were judged to have produced the best re-growth after one year by Mr. Richard Wright, the Society’s President and immediate past chairman, and Mr. Norman Farnsworth, both members of the committee. With modern machinery and economic pressures the art of hedge-laying, which is essential to rejuvenate a hedge and to maintain its stock proofing qualities, has been in danger of dying out. Therefore it is the aim of the Hedge-Cutting Societies such as ours to maintain and encourage the skill and expertise of hedge laying and to make sure that the craft is carried on and passed down to future generations. To this end the Society periodically sponsors courses organized by the Rutland Training Group and the committee is eager to sponsor anyone who is interested in learning or improving their skills in this ancient craft. The Society is willing to sponsor a training course next winter through the Rutland Training Group subject to demand. This is a two-day hedge-cutting course, and all interested in attending the 2013/14 hedge-cutting course should contact the Rutland Training Group Secretary, Jacqui Griffin, on 01572 770 614 or the Society's secretary on 01572 755 744. THAT AMOUNTS TO ALMOST 1.5 MILES IN TOTAL LENGTH. THE CRAFT OF WOODLAND COPPICING IS USED TO PROVIDE ALL THE HAZEL STAKES AND BINDERS AND THE POSTS AND RAILS WHICH ARE CUT OUT, TRIMMED, BUNDLED AND TRANSPORTED TO THE SITES AND THAT WORK HELPS TO CREATE MORE WOODLAND HABITAT AND REGENERATE MORE WOODLAND.